REVESERVATIONS: When reserving rental items, a 30% down payment is required to confirm the reservation and a valid credit card number will be kept on file. We charge a 14% damage waiver, which will cover minor damages and small loses. Any major damages or losses will be charged accordingly. 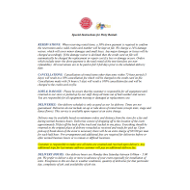 If the damage waiver is declined then the credit card on file will automatically be charged the replacement or repair cost if a loss or damage occurs. Orders which include tents- the down payment is the total rental of the tent (tent fees are nonrefundable). All reservations are to be paid in full 3 full days prior to the scheduled delivery date. CANCELATIONS: Cancellations of rental items other than tents within 72-hour period (3 days) will result in a 50% cancellation fee which will be charged to the credit card on file. Cancellations made with 24 hours (1 day) will result a 100% cancellation fee and will be charged to the credit card on file. LOSS & DAMAGE: Please be aware that the customer is responsible for all equipment until returned to our store or picked up by our staff. Keep all items out of bad weather and secure. You are responsible for all equipment missing or damaged at replacement cost. DELIVERIES: Our delivery schedule is only as good as our 1st delivery. Times are not guaranteed. 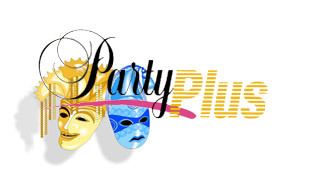 Deliveries do not include set-up or take down of rental items (except tents, stage and dance floors). This service is available upon request at an extra charge. Delivery may be available based on minimum orders and distance from the store for a fee and during normal business hours. Deliveries consist of dropping off to the location of the event approximately 50 feet off the back of the truck and stacked in one place. Everything should be returned to the original place of delivery restacked as received and ready for pick up. Upon pick-up if break down of the event is necessary there will be an extra charge of $25.00 per man for each half hour. Pre-arrangement and additional fees are required for deliveries before or after normal business hours or to remote or difficult locations. Customer is responsible to make sure all items are counted and received upon delivery. Any additional trips for last minute add-ons customer will pay an additional delivery fee. DELIVERY HOURS: Our delivery hours are Monday thru Saturday between 8:00am - 5:00pm. We prefer to deliver a day or more in advance of your event especially for installation of tents. Exceptions to this are due to weather conditions, quantity of deliveries for that particular day, complexity of job, and availability of job site. TENT RENTALS: Make sure that you get the pink flags we provide to mark the area of the placement of the tent so when we arrive, and no one is there we can proceed to set-up for your event in a timely manner. Once we arrive on a job if we have inactive crew time there will be an extra charge. Customer is responsible for identifying all underground utilities. 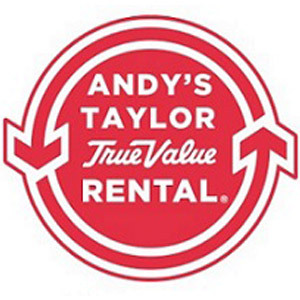 Taylor Rental is not responsible for any damage to underground utilities. TABLES: To avoid additional charges, no staples or thumb tacks are allowed in the tables. If returned with staples or thumb tacks this will result in a charge of .25 per staple. LINENS: When finished with linens they must be dry and free of food and debris. Place them in the clear bags that we provide. If the linens are wet or badly soiled place them in a separate bag to prevent possible damage to other linens. If linen is lost or returned torn, burned, mildewed or soiled beyond cleaning, the replacement value will be charged to the credit card on file in addition to the rental charge. Do not launder linens. SPECIAL ORDER LINENS: Must be confirmed no less than 10 days prior to delivery date. Once they are shipped you are obligated to pay for the rental. No exceptions. DISHWARE: Please return all dishes, flatware, and glasses fully rinsed and clean of food, sorted, and placed back in the proper racks. Please advise in advance if dishes and flatware will not be cleaned. A cleaning fee of .30 per piece will be assessed for any items returned unclean. BEVERAGE FOUNTAINS: No pulp! Clear liquid only, do not disassemble, plug direct, no extension cords. After each use, put clean, fresh water in bowl (preferably warm), let run approximately ½ hr. to dissolve any sugar residue. WARNING – DO NOT RUN FOUNTAIN DRY. DO NOT IMMERSE BASE OF FOUNTAIN IN WATER. If the beverage needs to be chilled, pre-cooling the beverage is preferred. You can also add chunks of ice, or small bags of ice to keep the beverage cool. PROCESSING FEE: A credit card processing fee of 3% will be added to all manual entry transactions. SLUSHY MACHINE: To clean, run warm water through until clear. DO NOT DISASSEMBLE!!! THERE WILL BE $450.00 CHARGE IF THE CLEAR DOME IS CRACKED OR BROKEN, this is not covered by damage waiver!! !